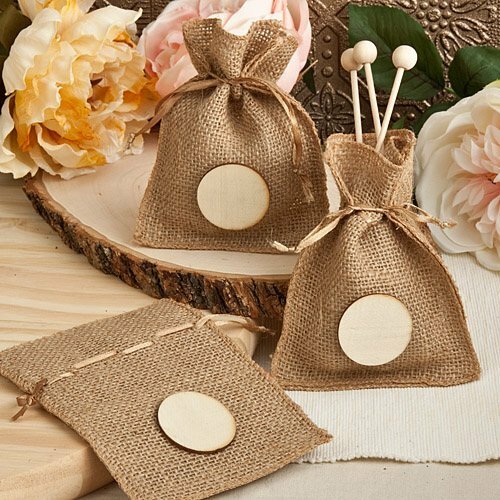 Using our Perfectly Plain Collection Small Burlap Bags is a great way to present your favors to your guests! 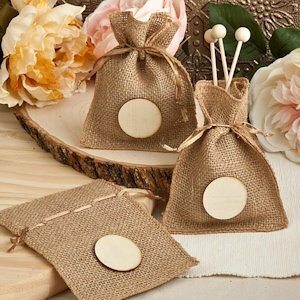 The natural colored burlap bags feature a matching satin drawstring near the top of the bag to help keep your goodies inside enclosed. (Contents pictured are not included). Each bag measures 5 1/2" tall x 4" wide. The front of the bag holds a 1 1/2" natural wood disk that can be left plain or can hold a personalized label (not included). For the version of this favor that offers a personalized label, please search 6766ST.